There are several fun and interesting ways to support BFC! Most importantly, we hope you will purchase t-shirt, calendars, and other products from our BFC online store where all proceeds go to protect wild buffalo. And…please check out all of the options that benefit BFC! 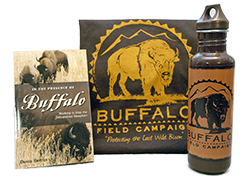 Shop for apparel and gift items to support your favorite animal—the buffalo! with your BFC specialty license plate. BFC will receive a percentage of your purchases when you shop at Amazon. Bid on cool items like celebrity-signed memorabilia – to benefit buffalo. When you shop through GoodShop, you save money and BFC earns a donation. Please select BFC as your favorite charity on eBay!